Levetiracetam is an anticonvulsant medication used to treat epilepsy. Levetiracetam reduces DNA, synaptic, and neurite damage caused by Dox. (A) An example of cortical cultures pre-treated with 5 μ M Lev and then Dox (0.01 μ M, overnight), fixed and stained with antibodies against MAP2c. Scale bar is 20 μ m. (B) Cortical neurons at 28–32 DIV were pre-treated with 5 μ M Lev, and then a vehicle or with Dox (0.01 μ M for 3 days, or 0.1 μ M, overnight) was added. Neurons were fixed, and stained for MAP2c, synapsin, and with the Hoechst dye, and imaged. Note that red MAP2c staining also includes Dox's red fluorescence. (C) Synaptically developed primary cortical cultures at 28−32 DIV were pretreated with 5 mM Lev, and then a vehicle or with Dox (0.01 μM for 3 days, or 0.1 μM, overnight) was added. Neurons were then fixed, and stained with antibodies against γH2A.X and MAP2c, and with the Hoechst dye. Blue staining was used by the algorithm to identify and analyze γH2A.X. Amlodipine Besylate is a long-acting calcium channel blocker, used to lower blood pressure and prevent chest pain. Cilnidipine is a unique L-type and N-type calcium channel blocker, used for high blood pressure treatment. Ranolazine 2HCl is a calcium uptake inhibitor via the sodium/calcium channal, used to treat chronic angina. Bepridil hydrochloride is an anti-anginal drug classified as a calcium channel blocker. 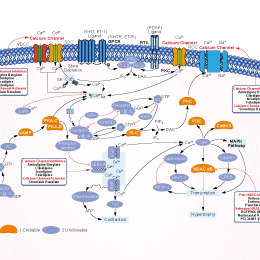 It also blocks multiple other ion channels, including sodium and potassium channels. Nicardipine is a potent calcium channel blockader with marked vasodilator action. Rhynchophylline, an active component isolated from species of the genus Uncaria, acts as a calcium channel blocker and is widely used in traditional Chinese medicine mainly for treating ailments of central nervous and cardiovascular systems, such as lightheadedness, convulsions, numbness, and hypertension. Lanthanum(III) chloride is the inorganic compound used in biochemical research to block the activity of divalent cation channels, mainly calcium channels. Fendiline hydrochloride is the hydrochloride salt form of Fendiline, which is an L-type calcium channel blocker and also a specific inhibitor of K-Ras plasma membrane targeting with no detectable effect on the localization of H- and N-Ras. Efonidipine is an L- and T-type calcium channel blocker leading to vasodilation and decreased automaticity of the heart. It also suppresses aldosterone secretion from the adrenal. Verapamil HCl is an L-type calcium channel blocker that is a class IV anti-arrhythmia agent. f, Cells were pretreated with or without 5 μM verapamil and then treated with the indicated concentrations of 17-DMAG for 6 h. The proteins involved in ALK-related signaling were detected by western blot analysis. Manidipine 2HCl is a HCl salt form of Manidipine, which is a calcium channel blocker with IC50 of 2.6 nM, used clinically as an antihypertensive. Phase 4. Manidipine decreases the accumulation of HCMV Early and Late proteins. HFFs were infected with HCMV AD169 and then treated with test compounds or DMSO as a control. NTZ-treated samples were also included as a control for inhibition of E and L protein expression. At the indicated times p.i., total cell extracts were prepared and analyzed by WB with anti-IEA, anti-UL44, and anti-UL99 antibodies. Tubulin immunodetection served as a loading control. Images are representative of three independent experiments. Isradipine is a potent and selective L-type voltage-gated calcium channel blocker, used to treat high blood pressure. Amlodipine is a long-acting calcium channel blocker, used to lower blood pressure and prevent chest pain. Felodipine is a selective L-type Ca2+ channel blocker with IC50 of 0.15 nM. Manidipine is a calcium channel blocker (dihydropyridine type) that is used clinically as an antihypertensive. Nisoldipine (Sular) is a calcium channel blocker belonging to the dihydropyridines class, specific for L-type Cav1.2 with IC50 of 10 nM. Nilvadipine is a potent calcium channel blocker with an IC50 of 0.03 nM. Lacidipine is a L-type calcium channel blocker, used for treating high blood pressure. Nicardipine is a dihydropyridine calcium-channel blocking agent used for the treatment of vascular disorders. Nifedipine is a dihydropyridine calcium channel blocker, used to lower hypertension and to treat angina. The fold change of C-peptide content after octreotide, nicorandil and nifedipine treatment. Octreotide, nicorandil and nifedipine decreased insulin secretion in wild-type, heterozygous mutated and homozygous mutated cells. Clevidipine Butyrate is a dihydropyridine calcium channel blocker, uses as an agent for the reduction of blood pressure. Benidipine HCl is a hydrochloride salt form of benidipine which is a dihydropyridine calcium channel blocker. HC-030031 is a selective TRPA1 channel blocker that antagonizes AITC- and formalin-evoked calcium influx with IC50 of 6.2 μM and 5.3 μM respectively. Azelnidipine is a dihydropyridine calcium channel blocker. Tetracaine HCl is a hydrochloride salt form of tetracaine which is a potent local anaesthetic and a channel function allosteric inhibitor. Diltiazem HCl (Tiazac) is a benzothiazepine derivative with vasodilating action due to its antagonism of the actions of the calcium ion in membrane functions. SKF96365, originally identified as a blocker of receptor-mediated calcium entry, is widely used diagnostically, as a blocker of transient receptor potential canonical type (TRPC) channels. ML204 is a novel, potent, and selective TRPC4 channel inhibitor with apparent IC50 values of about 1 μM in fluorescent intracellular Ca2+ assays and about 3 μM in whole-cell voltage clamp experiments. It exhibits some selectivity within the TRPC subfamily of channels and higher selectivity against other TRP channels and non-TRP channels. Cinepazide maleate is a maleate salt form of cinepazide which is a vasodilator. YM-58483/BTP2 is a blocker of store-operated Ca2+ entry (SOCE), which regulates the activation of non-excitable cells such as lymphocytes. Ethosuximide is a succinimide anticonvulsant, used mainly in absence seizures; A calcium channel blocker. Antidepressant effects caused by systemic ethosuximide injection (200 mg kg−1, i.p. ; c, d) in the FST(forced swim test) and SPT (sucrose preference test) 1 h after treatment. Panaxadiol is a triterpene sapogenin originally found in species of Panax (ginseng) and exhibits anticancer, cardioprotective, anti-arrhythmic, and antioxidative activities. It inhibits Ca2+ channels, decreasing channel open time and open state probability in vitro and displaying anti-arrhythmic potential. DHBP, a viologen for electrochromic memory display agent, inhibits the calcium release induced by 2 mM caffeine and 2 μg/ml polylysine with an IC50 value of 5 μg/ml and 4 μg/ml respectively. Tetrandrine, a bis-benzylisoquinoline alkaloid derived from Stephania tetrandra, is a calcium channel blocker. (B) Measurement of the cellular LDs in 3T3-L1 preadipocytes (undifferentiated) or differentiated adipocytes on day 8 by Oil Red O staining. Phase-contrast images of the cells were also taken after the treatment (lower panels in B). Each picture in (B) is a representative of three independent experiments. (C) Quantification of the cellular TG contents in tetrandrine-treated 3T3-L1 preadipocytes on day 8 by AdipoRed assay. Values are mean ± SE of data from three independent experiments with three replicates. *P < 0.05 vs.control (no chemical). (D) 3T3-L1 preadipocytes were grown under the above-mentioned 3T3-L1 preadipocyte differentiation condition in Figure 1A. On day 8, tetrandrine-treated 3T3-L1 preadipocytes, which cannot be stained with trypan blue dye, was counted under microscope. The cell count assay was done in triplicates. Data are mean ± SE of three independent experiments. *P < 0.05 vs. control (no chemical). Lomerizine dihydrochloride is a relatively new L- and T-type calcium channel blocker used in the treatment of migraine. Dantrolene sodium hemiheptahydrate ia a skeletal muscle relaxant that acts by interfering with excitation-contraction coupling in the muscle fiber. Ethyl 3-Aminobenzoate can block the generation of action potentials via voltage-dependent Na+-channels and usually used for anesthesia, sedation, or euthanasia of fish. Levamlodipine is a pharmacologically active enantiomer of amlodipine which belongs to the dihydropyridine group of calcium channel blocker. It acts on the L-type of calcium channels and its treatment results in vasodilation and a fall in blood pressure. Cinnarizine is a medication derivative of piperazine, and characterized as an antihistamine and a calcium channel blocker. Strontium Ranelate is a strontium(II) salt of ranelic acid for (-)-desmethoxyverapamil binding to calcium channel with IC50 of 0.5 mM. Optovin is a reversible photoactivated TRPA1 activator. Bay K 8644 is a potent, selective activator of L-type Ca2+ channel with IC50 of 17.3 nM. Western blot analysis of myocardium lysate at 4 weeks. Hypertrophic markers were tested in mouse cardiomyocyte cell line HL-1 Bay-K-8644. Chlorocresol is an activator of ryanodine receptor. Lercanidipine is a vasoselective dihydropyridine calcium antagonist used for the treatment of essential hypertension. Cardamonin, isolated from the fruits of Alpinia species, is a chalconoid with anti-inflammatory and anti-tumor activity. It has been shown to be a novel antagonist of hTRPA1 cation channel with IC50 of 454 nM while does not interact with TRPV1 nor TRPV4 channel. Imperatorin, a naturally occurring psoralen-type furanocoumarin, is a potent myorelaxant agent and acts as a calcium antagonist on vascular smooth muscle. Praeruptorin E, isolated from Peucedanum praeruptorum Dunn., is a cardiotonic agent with selective cardiac calcium channel agonistic effect. Methyl syringate, a plant phenolic compound, is a specific and selective TRPA1 agonist. Astragaloside A (Astragaloside IV) is the primary pure saponin isolated from Astragalus membranaceus, which has been widely used for the treatment of cardiovascular diseases. Dantrolene sodium acts as a postsynaptic muscle relaxant by inhibiting Ca2+ ions release from sarcoplasmic reticulum stores by antagonizing ryanodine receptors. Disodium Cromoglycate is an antiallergic drug with IC50 of 39 μg/mL.